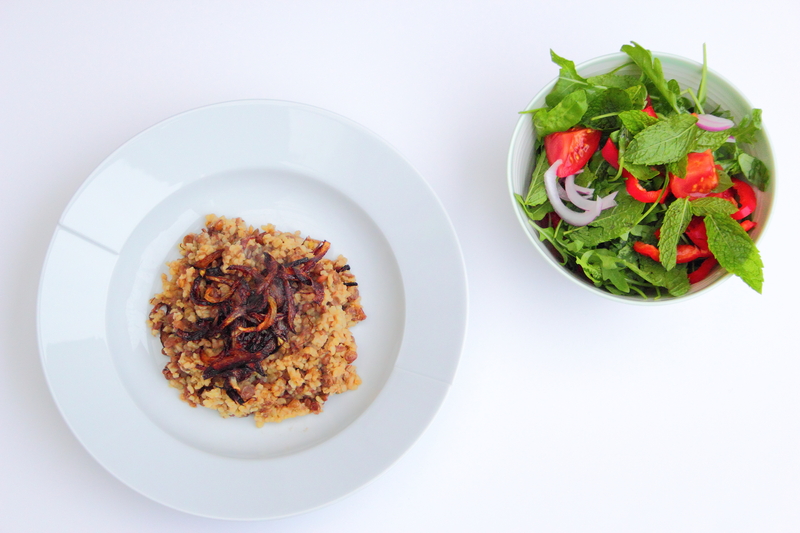 Mjadara (brown lentil and bulgur wheat pilaf) – Flogging Delicious! 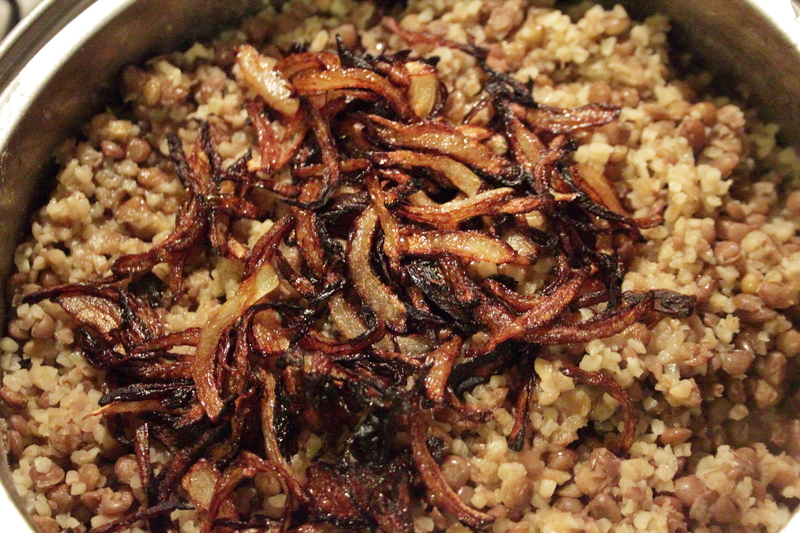 A huge debate between the Lebanese and Syrians surrounds the name of this dish. My family have always called this one Mjadara, but many of the Lebanese I know tell me off for calling it that! 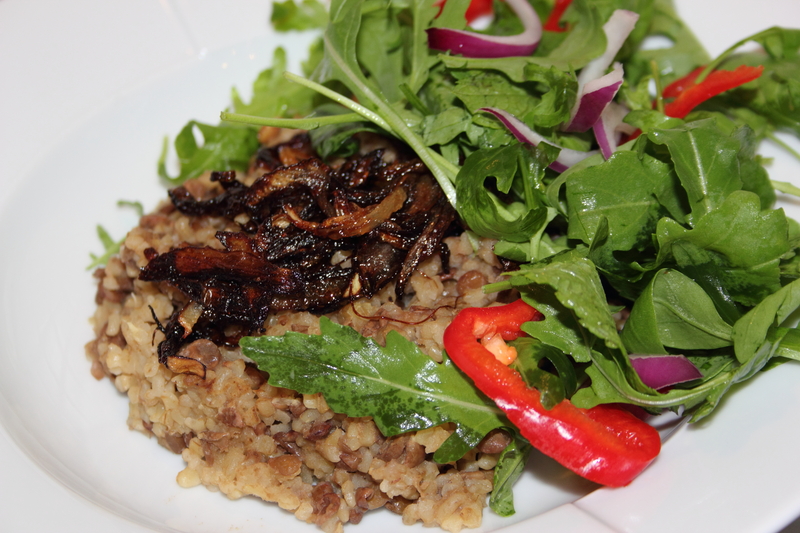 To them, Mjadara is a more soupy or custard-like lentil dish; but I’m sticking with my roots on this one! This is a really simple recipe that’s pretty much a one-pot wonder. It’s also pretty healthy, bar a generous amount of olive oil and some lovely, crispy fried onions added at the very end, but that’s what gives it a really nice taste. What’s even greater about this dish is that you can eat it hot or cold, so it’s super easy to take for lunch the next day. Also, if you’re a fan of having a few vegetarian days in the week, this dish really hits the mark. 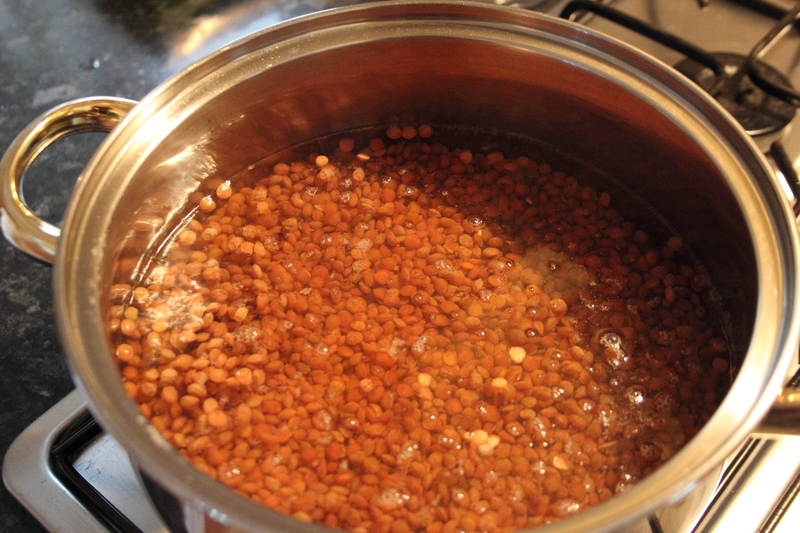 Add your cup of brown lentils into a large saucepan, cover with 2 inches of boiling water and season with salt. Bring to the boil and leave to cook on medium heat until the lentils have lost their bite but are not mushy (this usually takes about 25 minutes). N. B. If you find that during this time the water is drying out, just add a little more. 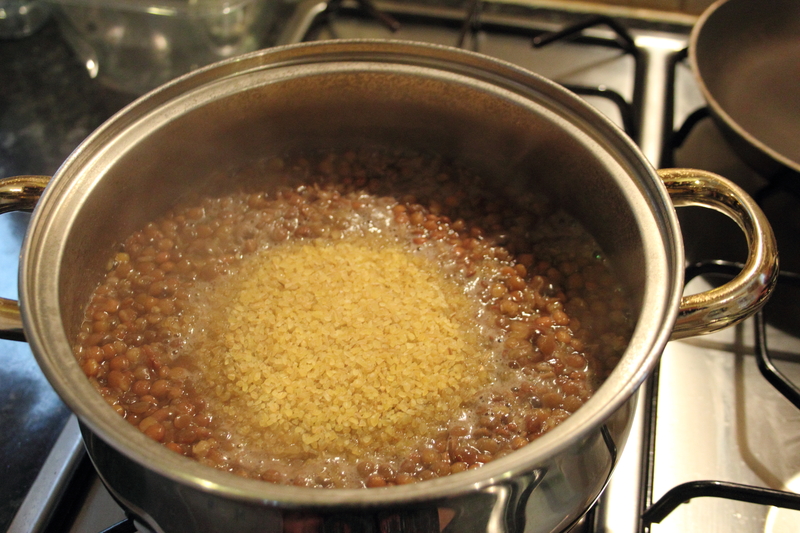 Once you are happy with your lentils, add the bulgur wheat into the pan and stir. Cover with a further inch of water and bring to the boil. Now, cover the saucepan and turn the heat right down and leave for all the water to absorb. Once you see that all the water has disappeared (give it a good stir and dig into the bottom of the pan to check), turn off the heat and leave the contents to steam in the pot for a good 15 minutes. 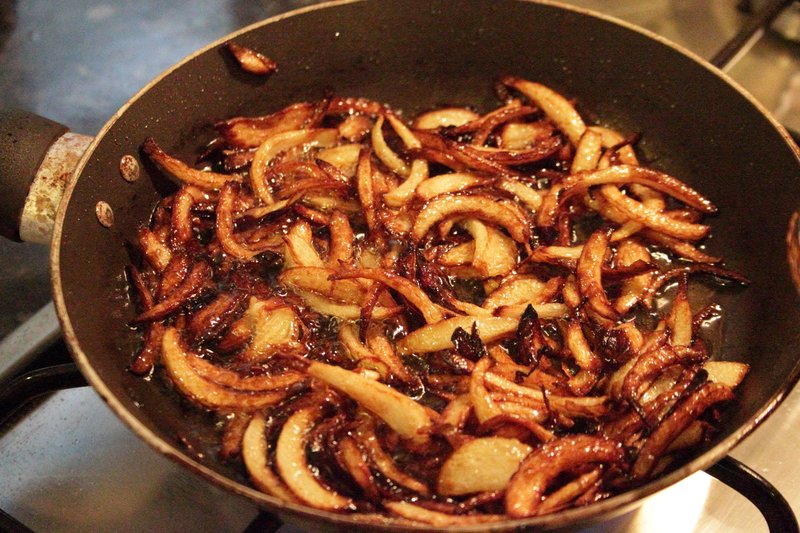 In the meantime, slice your onion into thin slices and fry in the olive oil until very brown all over and turning ever so slightly crispy. Pour the onions and their oil into the lentils mix and stir until all nicely combined. Serve with mixed salad with lemon and olive oil dressing.